Small but perfectly formed, this little gem of a book is the debut of Brian McGilloway, an author I am sure is set for great success. The Borderlands are the area between Northern Ireland and Eire. As the book opens, the body of a teenage girl has been found in this modern no-man's land, and two police detectives from either side of the border must decide who is to take the case. Because the girl turns out to live in Lifford, Inspector Ben Devlin of the Garda is the winner of this grim award, with his opposite number from the north, Jim Hendry, the loser. What follows over the next couple of hundred pages of this slight but telling book is a focused police procedural set during the next few days of Christmas and the New Year: an investigation hampered by weather, holidays and the need for co-ordination between the Northern and Southern administrations as witnesses, suspects and evidence turn up in the towns, hamlets and countryside on either side of the twisting border. 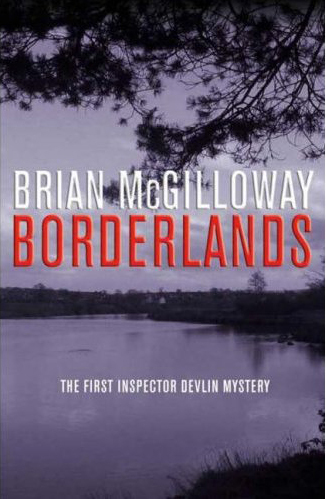 McGilloway weaves together a complex set of characters and motives, his canvas expanding as another victim is found, as drugs seem to be involved, as Devlin's own superior and colleagues come under suspicion, and as his own slightly tense domestic life is destabilised by an aggressive neighbour and by an old flame. Although Devlin strays from the straight and narrow both in running the investigation and in his marriage, he is essentially a good man whose innate honesty and doggedness take him further and further into an increasingly tangled web. As with many of the best crime-fiction novels, the strengths of this book lie both in its convincing portrayal of place, and in the shadows of the past, into which Devlin and his junior partner Caroline Williams, have to travel in order to make connections, and hence sense, of the present. My only complaint is that a map would have helped the reader to understand the geography of the investigation, the sensitive areas in which Devlin has to clear certain aspects with Hendry, the rather taunting northern detective, and the strangely surreal area in which the events play out. Nevertheless, the author barely puts a foot wrong in this confident book. Major and minor characters are portrayed with an efficient ease that makes them real people; their personal difficulties as well as their significance to the plot combine to make a compelling whole. The final couple of chapters perhaps stray from the solid believability of the rest of the book. Although by the last quarter of the book it is relatively easy to work out who is responsible for the deaths and why, the author keeps the reader guessing as to the identity of the "who" right to the end. Once this is revealed, it is evident that there are one or two holes in the plot, but really, that doesn't matter in the overall scheme of this excellent and well-written book.